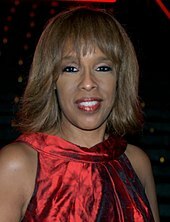 Gayle King (born December 28, 1954) is an American television personality, journalist, and author, who is co-anchor of the CBS News morning show CBS This Morning, a position she has held since its debut in 2012. She is also an editor-at-large for O, The Oprah Magazine. King was born in Chevy Chase, Maryland, to Scott and Peggy King. Her father was an electrical engineer and her mother was a homemaker. As a result of her father's work, King spent several years of her childhood in Turkey, where she attended an American school. The family later returned to Maryland. She graduated from the University of Maryland in 1976 with a double degree in psychology and sociology. King has been best friends with Oprah Winfrey since 1976. She is also a friend of Howard Stern, despite Stern and Winfrey's criticisms of each other.. Oprah described her as: "She is the mother I never had, she is the sister everybody would want, she is the friend everybody deserves, I don't know a better person". King was married to Bill Bumpus, an attorney and an assistant attorney general in Connecticut, from 1982 to 1993. She has a son and a daughter. King's career started as a production assistant at WJZ-TV in Baltimore, where she met Oprah Winfrey, an anchor for the station at the time. King later trained as a reporter at WTOP-TV in Washington, D.C. After working at WJZ, she moved to Kansas City, Missouri, where she was a weekend anchor and general-assignment reporter at WDAF-TV. In 1981, she was hired as a news anchor for WFSB in Hartford, Connecticut, where she worked for 18 years and became an Emmy Award-winning news anchor. Part of that time, she lived in Glastonbury, Connecticut. King worked as a special correspondent for The Oprah Winfrey Show. In 1991, King briefly cohosted an NBC daytime talk show with Robin Wagner called Cover to Cover, which was canceled after 13 weeks. In 1997, she was offered her own syndicated talk show, The Gayle King Show, which was cancelled after one season due to low ratings. On January 3, 2011, King began hosting a new show, also called The Gayle King Show, on OWN. The Gayle King Show ended on November 17, 2011, as a result of King's going to CBS to co-anchor CBS This Morning. King was rumored to be considered as a replacement for both Star Jones (in 2006) and Rosie O'Donnell (in 2007) as a host on The View, but neither of these came to fruition. King was also rumored to have been a potential replacement if co-host Elisabeth Hasselbeck had left The View in June 2013. King joined O, The Oprah Magazine as an editor in 1999. Before joining CBS News, King worked as a special correspondent for Good Morning America. On November 10, 2011, King secured a deal with CBS to co-anchor CBS This Morning, beginning on January 9, 2012. She has been described as one of the top anchors at CBS. She publicly announced on air for CBS to have full transparency when it was learned CBS planned on keeping the findings into sexual abuse and harassment at CBS private. In December 2018, it was rumored that King was furious with the controversies and the way things were being handled at CBS and that she might be ready to leave the network. She was described as having to hold everything together at CBS This Morning. She received recognition for remaining stoic while R. Kelly got up out of his chair and began to scream and beat his chest in an interview discussing the sexual abuse allegations made against the singer. In 2018, King was inducted into the Broadcasting & Cable Hall of Fame. She was also chosen as one of Time magazine's 100 most influential people of 2019. ^ Battaglio, Stephen (January 7, 2017). "Freewheeling news anchor and Oprah BFF Gayle King celebrates five years with 'CBS This Morning'". Los Angeles Times. ISSN 0458-3035. Retrieved November 21, 2017. ^ a b Hutcheson, Susannah (July 31, 2018). "Gayle King: How I became a 'CBS This Morning' host and O magazine editor-at-large". usatoday.com. USA Today. Retrieved January 9, 2019. ^ a b Bonawitz, Amy (July 16, 2007). "Gayle Opens Up About Ex-Husband's Cheating". cbsnews.com. CBS News. Retrieved January 9, 2019. ^ Late Show with David Letterman, April 3, 2008. ^ "Oprah Winfrey and Gail King - Chicago Tribune". www.chicagotribune.com. ^ The Howard Stern Show. Sirius XM Radio. Howard 100, New York. April 8, 2009. ^ The Howard Stern Show. Sirius XM Radio. Howard 100, New York. September 23, 2009. ^ a b c Hawkins, Carol Hooks (2009). American Women Leaders: 1,560 Current Biographies. McFarland. p. 204. ISBN 0786452757. ^ a b Cole, Maxine (December 1, 2017). "I Took My Former Boss, Gayle King, To Lunch & We Talked Breakups, Career Goals, & Yes, Oprah 2020". refinery29.com. Refinery29, Inc. Retrieved January 9, 2019. ^ Cole, Maxine (March 8, 1998). "Talk Show Host Gayle King Focusing on Family Life Issues". newsok.com. Retrieved January 9, 2019. ^ Littleton, Cynthia (April 16, 1998). "CBS Eyemark won't renew rookie yakker". variety.com. Variety Media, LLC. Retrieved January 9, 2019. ^ "Gayle King's Talk Show Cancelled for For Fall". Jet. Vol. 60 no. 93. Johnson Publishing. May 4, 1998. p. 60. ^ "The Mo'Nique Show - Interview with Naturi Naughton". wn.com. November 16, 2014. Retrieved January 9, 2019. ^ a b "Charlie Rose and Gayle King to Join Revamped Early Show Next Year". tv.yahoo.com. TV Guide. November 10, 2011. Retrieved January 8, 2019. ^ "Oprah's BFF to 'The View'? Look Out, Star". Fox News. May 5, 2006. ^ "Rosie O'Donnell Decided to Leave 'View' When Walters Failed to Defend Her Against Trump". Fox News. April 25, 2007. ^ a b Alexandra, Steigrad (February 23, 2017). "Gayle King On Magazines, Morning Shows and Megyn Kelly". wwd.com. Penske Media Corporation. Retrieved January 8, 2019. ^ Steinberg, Brian (January 7, 2018). "Susan Zirinsky Gears Up for New Era at CBS News". variety.com. Variety Media, LLC. Retrieved January 9, 2019. ^ Saad, Nardine (September 11, 2018). "Gayle King says CBS 'must have transparency' after Moonves' departure". latimes.com. Los Angeles Times. Retrieved January 9, 2019. ^ "'Furious' Gayle King could leave 'CBS This Morning' following scandalous year: report". aol.com. AOL. December 17, 2018. Retrieved January 9, 2019. ^ McNamara, Mary (March 11, 2019). "In her R. Kelly interview, Gayle King proves she's got nothing to prove". Los Angeles Times. Retrieved March 12, 2019. ^ Edelstein, Robert (April 30, 2018). "B&C Announces Hall of Fame Class of 2018". broadcastingcable.com. Future Publishing Limited Quay House. Retrieved January 9, 2019. ^ DuVernay, Ava (April 2019). "Gayle King Is on the 2019 TIME 100 List". Time. Wikimedia Commons has media related to Gayle King.